Six years ago, May 17th fell on a Saturday just as it will this weekend. 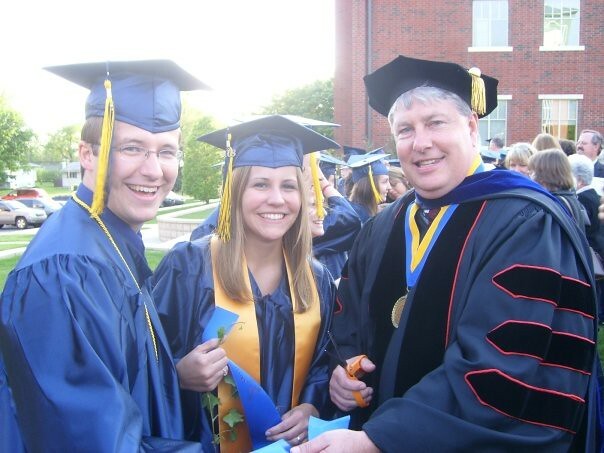 On that sunny afternoon at Spring Arbor University, your Daddy and I each received a diploma awarding us Bachelor of Arts degrees. We’d done it, achieved the American dream of graduating from college. I’d spent two years studying the liberal arts – English, communications, computer science, chemistry, sociology, and psychology – then two more years focused on every Biblical, Theological, and Philosophical class I could fit into my schedule. The end result was a Philosophy/Religion degree. And I don’t regret a minute of it. Your father’s scientific mind steeped itself in chemical equations, complex mathematics, and molecular structures. I am so proud to be married to a man with a Chemistry degree. I really am. There aren’t too many pastors with actual science degrees, and he is often able to tutor teens in algebra or chemistry because he gets it. His excellence in the field of biophysics also paid the bills (and our remaining student loans) for the first 2 years we were married. (Thank you, Wayne State University Fellowship.) Can’t be mad about being debt free. It’s rather poignant timing for Northeastern Seminary to be presenting Kevin with a Master of Theology degree on the 6th anniversary of the commencement ceremony for our undergrad. This Saturday will remind us that we’re no longer bright-eyed babes, looking with longing and wonder at the days ahead of marital bliss and building our lives together. He just 21 years old, and I was 22. We were mature and made wise decisions, even looking back. But we were just babies. And there many lessons that only time can teach. This Saturday, I’ll look back with a smile. Because this let’s-get-married-and-be-a-family thing was the best idea ever. Our life together is far more fulfilling than I ever dreamed it could be. Seriously, Child. I’m not making this stuff up. The blinders are off. The honeymoon is long over. The reality of bills and home management and endless responsibility isn’t new and overwhelming. (Ok, still overwhelming, but definitely not new.) And I respect your Daddy deeper every day. I feel more loved by him with every passing minute. Even with the bickering. Even with the pain of waiting for you. Even with the future of uncertainties.